​The Leaside Lawn Bowling Club has played a long history in the Town of Leaside and the former Borough and later, City of East York and now in the City of Toronto. The idea for this club began in the late 1940's when the Corporation of the Town of Leaside started to plan a park and sports complex (Howard Talbot Park) at the corner of Bayview and Eglinton Avenues. A recommendation was made to include two lawn bowling greens equipped with overhead lighting and an underground, water sprinkler system. A planning committee was formed with Art Donohue, the editor of the Leaside Advertiser, as chairman. In order to start the project, By-law 1390 was passed by the town council granting a loan of $20,000.00. Until such time as the capital cost of construction and equipping the bowling greens, and the carrying charges of such capital charges had been fully repaid, all monies received by the club from fees or for expenses were paid to the Town of Leaside at the close of each season. This amounted to approximately $2,000.00 a year. 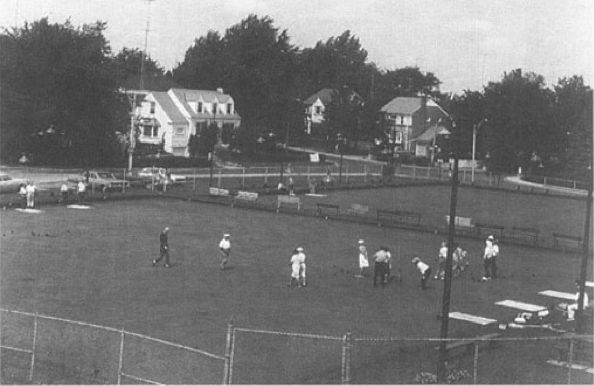 A clubhouse was built in 1952, and the Leaside Lawn Bowling Club was officially opened in 1953. The first president of the club was Joe Davis, a devoted teacher of the game and an excellent tournament bowler, who was known and respected throughout the province. ​Membership in the club was originally open to all male residents of the town of Leaside, who would be the only voting members of the club. Associate membership was also granted to persons residing outside the Town of Leaside and to ladies, provided that the admission of such did not unduly interfere with the use of the greens by residents of the Town of Leaside who were, or wished to become, members of the club. The annual fee for all male and associate members was $15.00 and for female members $10.00. In 1960, the membership chairman, Herb Cook, reported that there were 203 members, comprised of 93 male and 110 female. As well, there was a waiting list of 17. In 1977, the club signed a five year lease with the Borough of East York. This lease stipulated that the club was required to pay the Borough the sum of $1.00 each year. This was in addition to the amount currently being paid to the Town of Leaside for the original loan. This lease indicated that the Borough would be responsible for the maintenance of lighting, fencing, rink boards and the Clubhouse and also for the payment of hydro-electric and other public utility bills. The club was responsible for the maintenance and repair of the lawn bowling greens. The lease was not renewed in 1982. The property is now owned by the City of Toronto, and there are no plans to initiate a new lease. In 1990, the two divisions of the club, male and female, were amalgamated, and the first combined president was Dorothy Ranta . In 2002, the City of Toronto installed a new overhead lighting system and replaced the ditches and backboards, at a cost of approximately $100,000.00. In 2003, LLBC celebrated its 50th anniversary with a variety of special bowling events and a splendid recognition banquet. In 2011, the Clubhouse underwent a thorough renovation and is now accessible to those in wheelchairs. The club is currently managed by a board of directors and relies heavily on active volunteers from the membership to maintain this excellent lawn bowling facility.